Hi Friends: There is a new challenge today over at the Stinkin' Inkers Challenges Blog, where the current theme is Summer Heat. Stamp images and sentiment onto smooth white cardstock using black ink. Cut image with stitched rectangle die, ink edges, then add Glitter Brush pen to ice cream. Add metal clip to top corner of panel. Cut background paper to fit A2 card base, ink edges, wrap with baker's twine, then glue to card base. 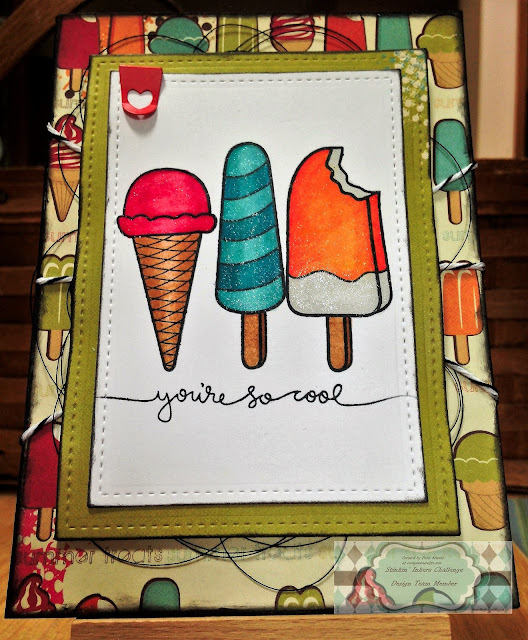 Cut coordinating background paper using larger stitched rectangle die, ink edges, mat behind focal image, then add to card base with foam squares. Finish with some black thread tucked behind the focal image.